If you're the parent of a young adult who is still living at home, you might be wondering whether this situation is commonplace. According to a recent U.S. Census Bureau study, it is: One in three young people (ages 18 to 34) lived in their parents' home in 2015. More young adults in 2016 had full-time jobs than their counterparts did in 1975. In particular, young women ages 25 to 34 are experiencing economic gains, with more than two-thirds in the workforce compared with less than half in 1975. Young women today are also earning more money than they did in 1975 — their median incomes have grown from nearly $23,000 in 1975 to more than $29,000 in 2016 (in 2015 dollars). 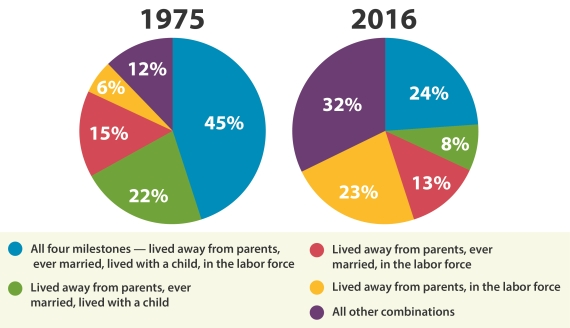 Despite the educational and economic advances that young adults have made over the last 40 years, many are postponing traditional adult milestones. In fact, a majority of young adults are not living independently of their parents. Of the 8.4 million 25- to 34-year-olds still living at home, one in four are not attending school or working. It's important to note, though, that this could be because they are caring for a family member or have health issues or a disability. Compared to 40 years ago, the timing and accomplishment of milestones on the path to adulthood are much more diverse and complex today. To view the full report, visit census.gov.